The moment you have been longing for is finally here and your love will be in your arms before you know it! Hallelujah, hallelujah… Oh sweet baby, HAL-AY-LUUU-YA! Homecomings are a time to celebrate, enjoy, relax, and just take in every little moment with every breath of anticipation, happiness and of course, relief! 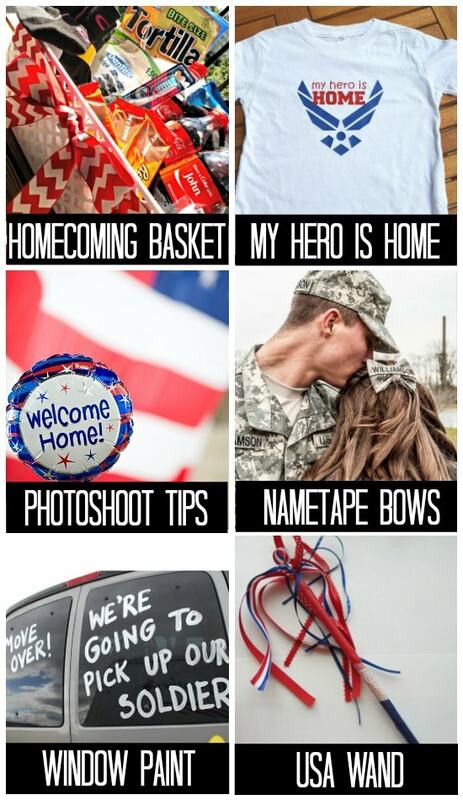 We have put together 101 ideas for making your military homecoming experience as fun and exciting as possible! Take a seat and get ready to be inspired. 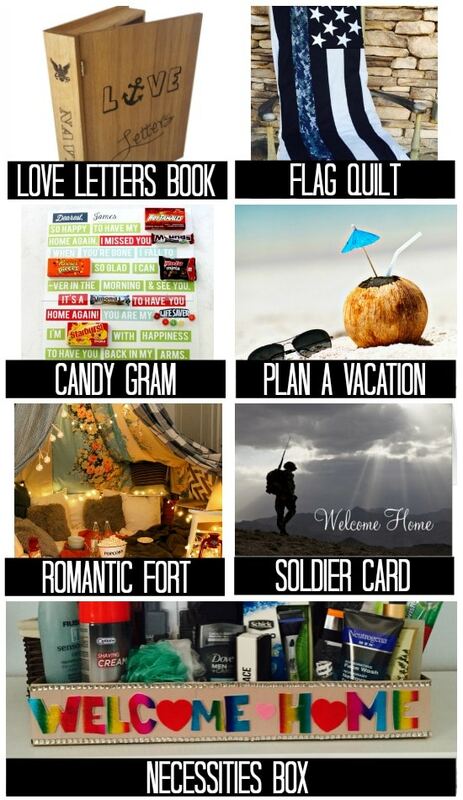 You will have everything you need to create the perfect day of welcoming home your soldier! It’s hard not to imagine over and over again the upcoming moment you will finally make eye contact and rush to embrace… the words of your heart screaming: “I love you! I missed you!”. We have compiled the best ideas, divided into specific categories, for optimum welcome home planning! 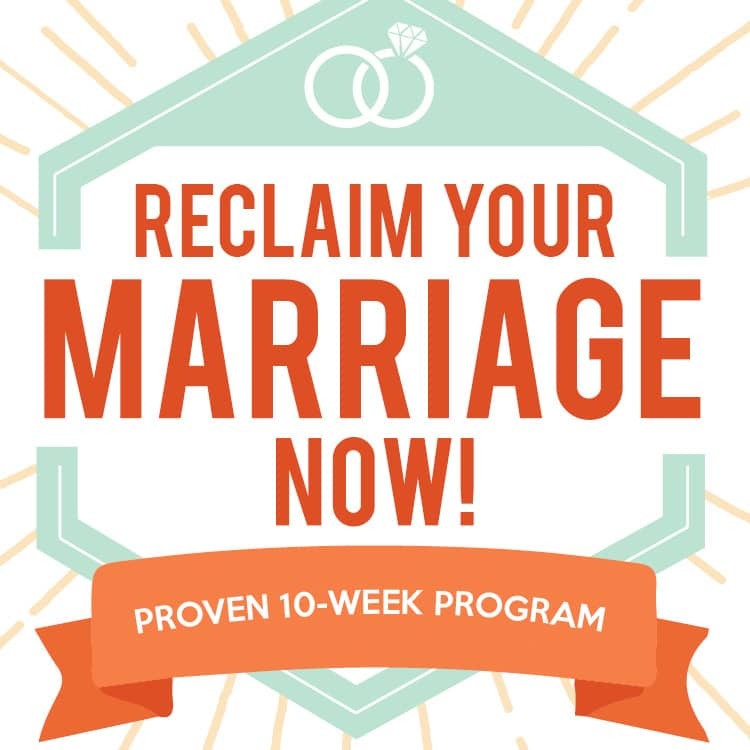 Take all that lovin’ energy of anticipation and use it to create some fun and personal ways of celebrating this tender reunion and creatively telling your spouse just how anxious you have been for their return! You have counted down the days to this military homecoming! You have dreamt of how it will go, make sure you’re ready with these ideas for immediately after your honey arrives back into your arms! 1. 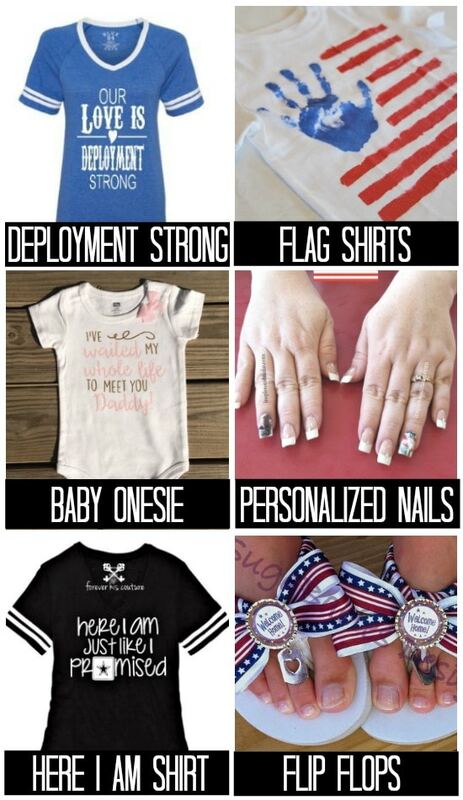 Deployment Strong Shirt (Designs by Ally 4 U) – Your love is deployment strong, that is something to be proud of! 2. Flag Shirts (The Storibook) – Make matching shirts for your whole family to welcome back your military member! 3. Baby Onesie (Liberty and Knox) – Did your spouse miss the birth of you baby? Make the moment they first meet just as special with this clever onesie! 4. Personalized Nails (Inspire and Make) – Design nails that are personalized with your soldier’s picture, or another festive design! 5. Here I am Shirt (Forever His Couture) – A cute shirt to show your military spouse you kept your word. 6. Flip Flops (SugaBaby Designs) – Show your man you are excited from your head all the way down to your toes! 7. Homecoming Basket (Jo, My Gosh!) – Make him a gift basket full of necessities (and treats!). 8. My Hero is Home (Love Across the Miles) – A sweet shirt to let your military family member know how proud you are of them. 9. 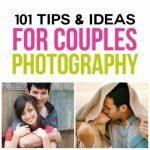 Photoshoot Tips (MCP Actions) – Schedule a professional photographer to capture all of the emotions of your spouse’s return. 10. Nametape Bows (Inspired Design XoXo) – Can we just swoon for a moment over how adorable this bow is?! 11. Window Paint (It’s Twinsanity) – Your soldier will have no doubt what car is taking them home! 12. USA Wand (Quirky Inspired) – Your kids will love to have a patriotic wand to wave around at the homecoming! 13. Dog Tags (Picture Me Always) – Show your pride by wearing these cute, personalized dog tags to pick up your soldier. 14. 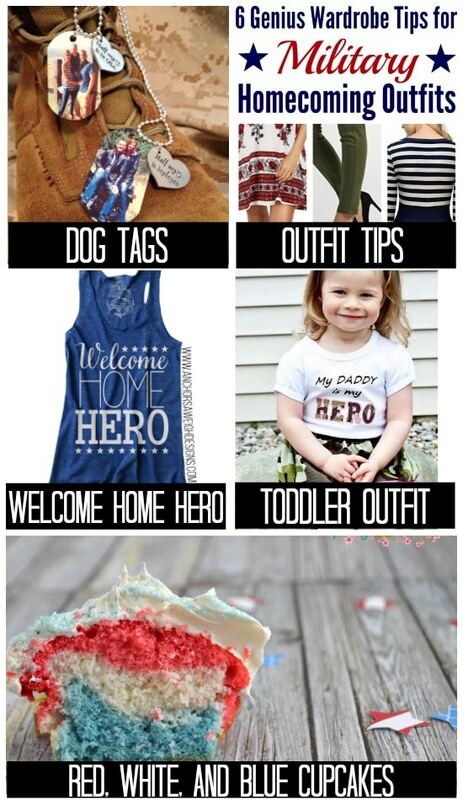 Outfit Tips (Military Wife and Mom) – With all of the anticipation and to-do lists, check your outfit off of the list with these great tips! 15. Welcome Home Hero (Anchors Aweigh) – Welcome your hero home in style! 16. Toddler Outfit (Addie Kat Boutique) – Let your little girl in on the fun of getting all dressed up to welcome your spouse home! 17. Red, White, and Blue Cupcakes (Quirky Inspired) – Why wait until you get home for the party to start? Bring these festive red, white, and blue cupcakes to the homecoming! You have waited, anticipated, and prepared for this moment of reuniting! A sign with the perfect phrase or saying is a fun way to welcome your spouse home! 18. 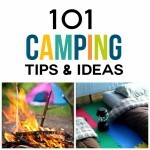 101+ Sign Ideas (A Semi-Delicate Balance) – With 101+ sign ideas to choose from, you are sure to get the inspiration you are looking for! 19. Signs by Category (Our Army Life) – This list contains several categories to find the sign that is the perfect fit for you or your family! 20. 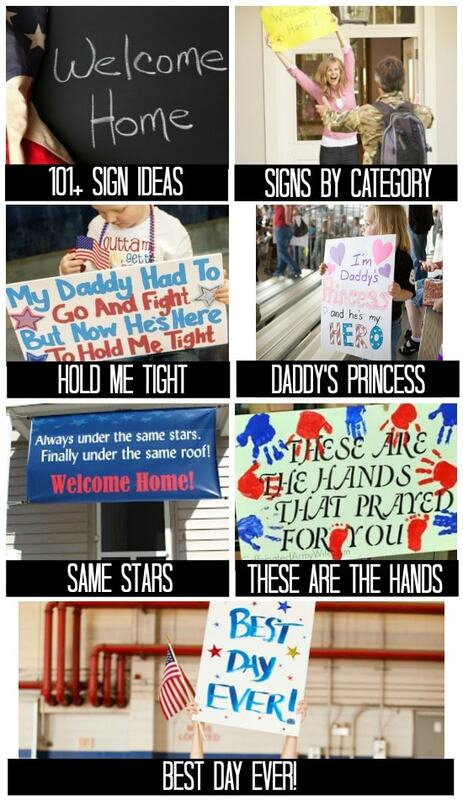 Hold Me Tight (Pinterest) – The perfect sign for your little one to welcome their daddy home! 21. Daddy’s Princess (MCP Actions) – If Dad is your little girl’s hero, this cute sign would be perfect! 22. Same Stars (Thou Shalt Grow) – Finally under the same roof, now that is something to celebrate! 23. These Are the Hands (Caffeinated Army Wife) – You waited and prayed for months for their safe return, now enjoy every moment of welcoming them home. 24. Best Day Ever! (Two Bright Lights) – This is a simple, sweet and incredibly joyful sign! 25. Kiss Your Mini Me (Creative Life Customs) – A cute idea for your little ones to hold up on the exciting day of welcoming your soldier home! 26. Simple and Bold (Lizton Sign Shop) – Your soldier will love this simple but bold sign to welcome them home. 27. 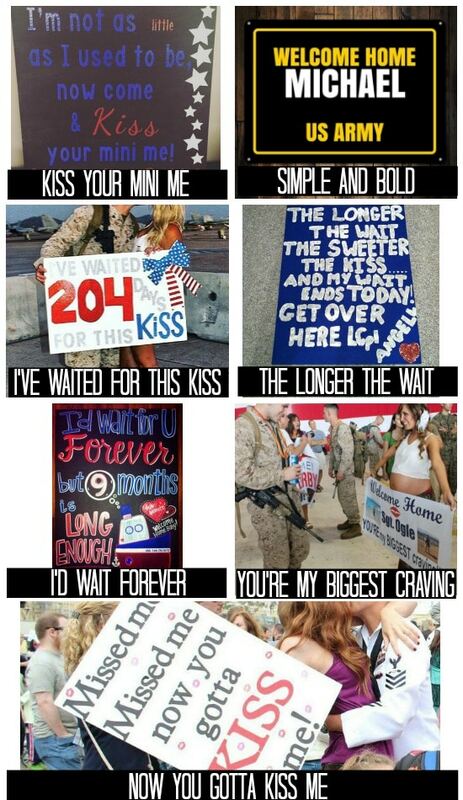 I’ve Waited For This Kiss (Pinterest) – This sign sets you up for the perfect moment AND the perfect photo! 28. The Longer the Wait (Experience Project) – You have been anticipating this moment for so long, that kiss is going to be so, so sweet! 29. I’d Wait Forever (Charleston Chalk Chick) – The sign is not only completely gorgeous, but this is such a cute saying! 31. Now You Gotta Kiss Me (Pinterest) – Sweet and simple. This sign is perfect for welcoming him home! 32. Finally Home (Grace-Marie Photography) – Your heart is finally home, now that is something to celebrate! 33. Welcome Home, Daddy! 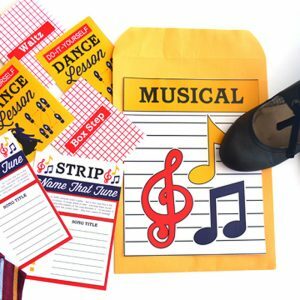 (Two Bright Lights) – Let your little one get involved in the sign making process! 34. Guess Who? 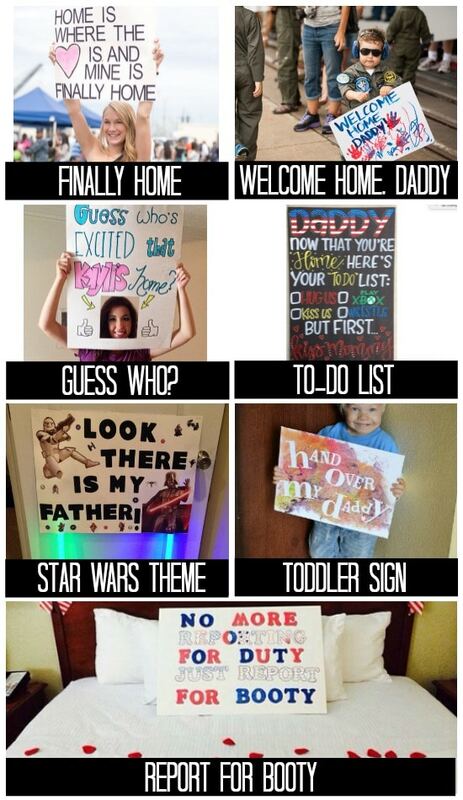 (Pinterest) – Would your military spouse appreciate a little humor over a sappy sign? This will be perfect! 35. To-Do List (Charleston Chalk Chick) – This is a to-do list that your military love will gladly accept! 36. Star Wars Theme (Pinterest) – The perfect sign for your Star Wars fan! 37. Toddler Sign (Glued to My Crafts) – Not only is this sign cute, but it is a great way for your toddler to get in on the creation process! 38. Report for Booty (Pinterest) – This sign is hysterical… and pretty fitting for the occasion! Keep the excitement high! Driving up to the house has to be the most exciting and comforting moment of the entire deployment. You will all finally be reunited under the same roof! Decorate the outside of your house for a grand welcome home! 39. Star Luminarias (Sunset) – This is the perfect nighttime welcome home. These bright DIY lanterns will welcome your military spouse home in a cool, unexpected way! 40. Balloon Walkway (A Semi-Delicate Balance) – Use golf tees to create a grand walkway of helium balloons leading your love home! 41. 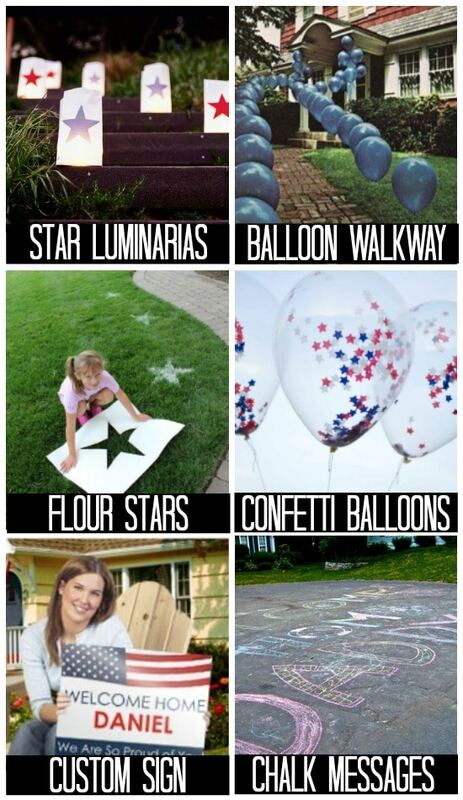 Flour Stars (Good Life of Design) – Cover your lawn or sidewalk with flour stars. This is a great idea that your kids can even help out with! 42. Confetti Balloons (Balloon Up) – These star-confetti filled balloons would be an adorable addition to your celebrations! 43. Custom Signs (BuildASign.com) – Create a custom, professional sign to hang outside your house. 44. Chalk Messages (Military Spouse) – Make colorful messages for your soldier to drive home to. This site also has a ton of other ideas for making homecoming special. 45. House Banner (Art Ville Designs) – Personalize this banner and hang it on your porch or on your garage! 46. Patriotic Ballons (Party Surprise) – These patriotic balloons are perfect for the occasion! 47. Star Balloon Welcome (Pinterest) – I love the idea of balloons leading up to the door, these red, white, and blue stars are the perfect touch! 48. USA Water Blob (Club Chica Circle) – Have some fun and get a little wild on this flag shaped water blob! 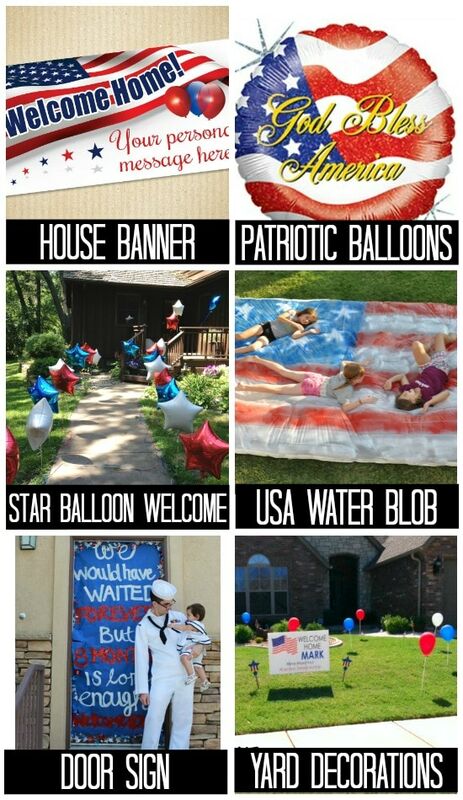 It is a patriotic decoration and a ton of fun! 49. Door Sign (Making Home Base) – It’s a gift to have them home! Wrap your door in a large life-size homecoming poster! 50. Yard Decorations (Sunburst Gifts) – Get the whole neighborhood excited by decorating your entire yard! 51. Kite Garland (Brit + Co) – This is one of the most fun and festive red, white and blue garlands there is! 52. Welcome Banner (Army Mom of Twins) – A cute welcome home banner is a great way to dress up your home for the arrival of your soldier. 53. Home of the Brave (The Golden Sycamore) – It doesn’t get much cuter or more fitting than this adorable chalkboard sign. 54. DIY Wreath (The Frugal Female) – Get out your crafting supplies and start preparing an adorable red, white, and blue wreath. 55. 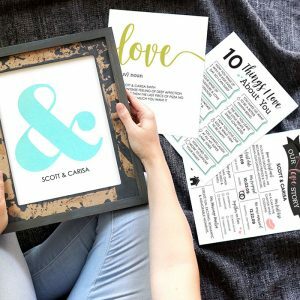 Chalkboard Printables (Yellow Bliss Road) – These printables are not only free but are also adorable. Hang them up to show your pride. 56. 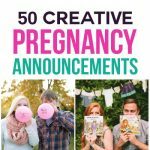 Balloon Avalanche (Do it and How) – Let the balloons rain down on your military spouse the moment they walk through the door! 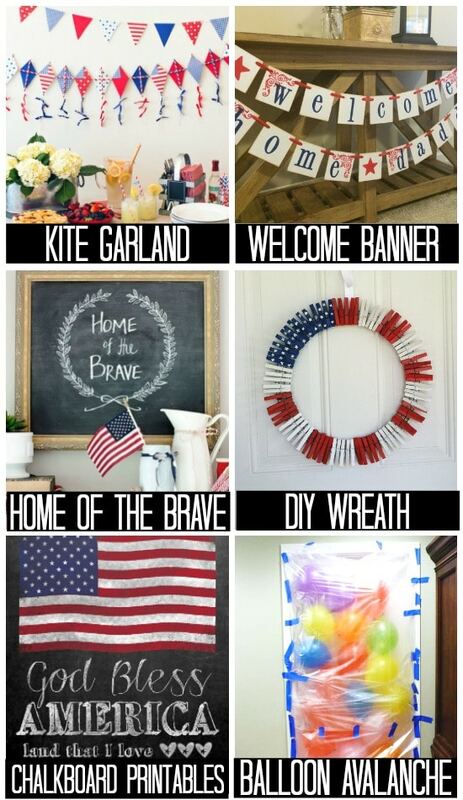 Show your military spouse how proud you are of them and their service by displaying one (or several) of these ideas around your home! 57. 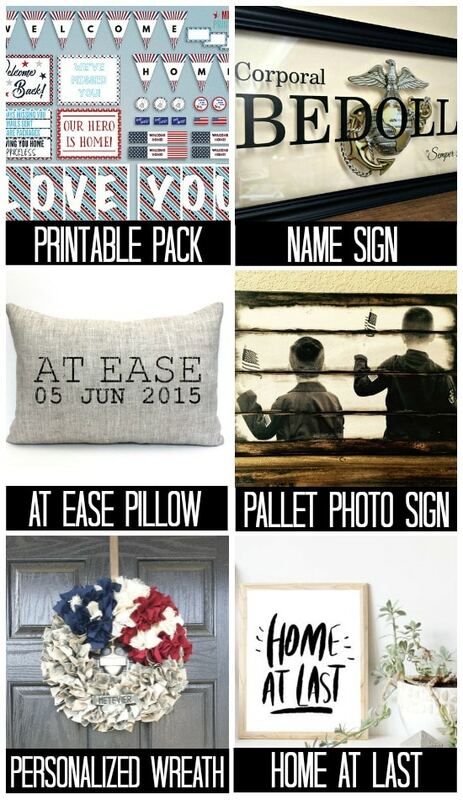 Printable Pack (Military Printables) – A printable pack that has it all! This pack is so cute and has everything that you will need. 58. Name Sign (The Binding Tie) – The perfect new piece of decor to hang on your wall and show your spouse, and anyone who visits your home, how proud you are. 59. At Ease Pillow (Cover Love) – This pillow is adorable and a great way to remember the date you were reunited! 60. Pallet Photo Sign (The Saylors Anchor) – Do you have a great photo taken during the deployment? This is a unique way to display it for your military spouse when they arrive home. 61. Personalized Wreath (My TTT) – This wreath is not only perfect for hanging on your door for the homecoming, but it’s so cute you could keep it hanging all year round! 62. Home at Last (SarahLuLetters) – This sign is so cute you can keep it up and keep the happy feelings alive for years to come! 63. Patriotic Banner (Modest Edge) – A simple and beautiful banner perfect for welcoming your military spouse back home. 64. 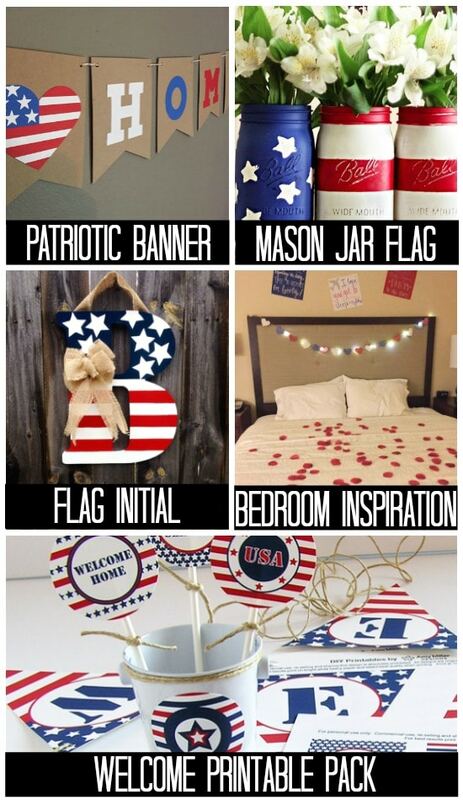 Mason Jar Flag (Liz Marie) – Fresh and lovely decor to create the most welcoming environment! 65. Flag Initial (Simply Me Kreations) – A spin on the normal wreath, this red, white, and blue letter is a cute alternative! 66. Bedroom Inspiration (Pinterest) – You have made sure the rest of the house looks great, now make sure your bedroom is properly ready to welcome your military spouse home! 67. Welcome Printable Pack (Amy Miller Designs) – Military printables that are cute and free–the perfect combination! Your sweetheart is finally home! Show them just how much you have been thinking of them with one of these amazing welcome home gifts! 68. Welcome Cookies (MJ Cookies Confections) – Welcome your military spouse home with the cutest cookies out there! 69. Thoughts in a Jar (The Gunny Sack) – Write down thoughts or funny stories and collect them in a jar. When your military spouse arrives home, go through the jar together! 70. 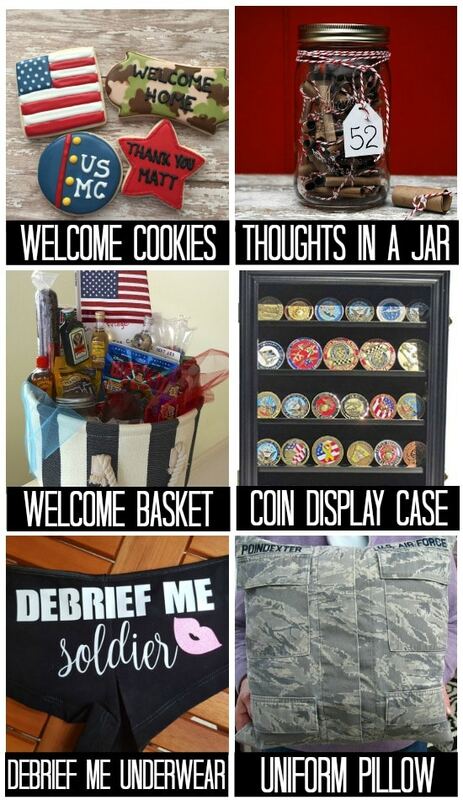 Welcome Basket (Our Army Life) – Create a care package, but this time you don’t have to mail it! 71. Coin Display Case (Amazon) – This challenge coin display case will allow your soldier to show off their unique collection. 72. Debrief Me Underwear (Love Across the Miles) – Let’s just get right down to it. You missed him! These will be the perfect welcome home “gift”. 73. Uniform Pillow (Exuberant Color) – Make a keepsake you will always treasure using the uniform he served for so many months in. 74. Cuff Links (AngleAh) – Give him a reminder and a thank you for the amazing service he gave. 75. Marine Corps Flag (iSTICKerTHAT) – Show your spouse how proud you are of their service with this unique piece of decor. 76. Keepsake Box (five1gifts) – This personalized, engraved box is an amazing gift for your military spouse. 77. Ammo Can (Craft Up Your Life) – A unique and clever welcome home gift that any soldier will appreciate. 78. Charm Bracelet (Our Little Charms) – This bracelet is an incredible way to show her how proud you are of her and her service. 79. 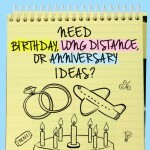 Long Distance Frame (Itsy Bitsy Frame Shop) – You have proven that no distance is too far for your love. This could also be a great DIY project! 80. 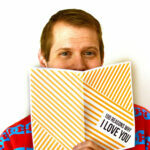 Love Letters Book (Five1Designs) – Collect all of your love letters and keep them safe in this gorgeous little box. 81. Flag Quilt (Zabes Quilt) – A handmade American flag quilt makes for an amazing welcome home gift for your soldier. 82. Candy Gram (The Dating Divas) – A sweet treat paired with a sweet welcome home message–what more could you ask for? 83. Plan a Vacation (USMC Life) – Reconnect and relax by planning a post-deployment getaway! 84. Romantic Fort (BuzzFeed) – The gift you both really want is quality time and connection. Build a fort and have a romantic night reconnecting. 85. Soldier Card (Zazzle) – Add this welcome home card to your celebrations. It’s a great way to write down all of your feelings before things get crazy! 86. 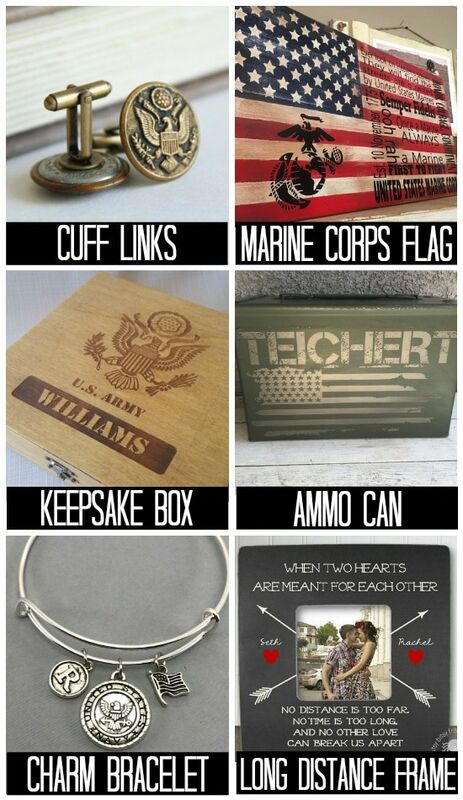 Necessities Box (Pinterest) – Fill a box with all of the must-have items that your military spouse will be needing! The excitement of the day of a military homecoming is unbeatable. After they arrive home, real life sets in. Prepare yourself and your family using these resources! 87. 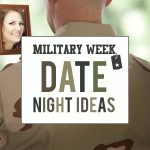 Ways to Make it Special (MilitarySpouse) – This post contains tons of very clever ideas to make the homecoming as special as possible. 88. Advice From Spouses (Jo, My Gosh!) – Tips and advice from military spouses who have been through this exciting/challenging time themselves. 89. Life After Deployment (Amazon) – This highly rated book has been described as a “must-have” for all military families preparing for a homecoming. 90. 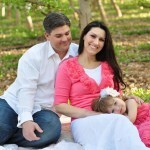 Tips for Great Photos (Kallie Frances) – Be sure you get amazing photos of those sweet moments of reuniting. 91. 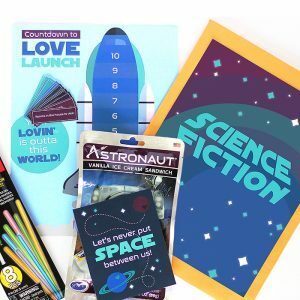 Welcome Home Kit (The Dating Divas) – If you want a complete kit with everything from signs and love notes to activities and bedroom games, this post has everything you will need to properly welcome your spouse home! 92. 5 Tips for Transition (Military.com) – Let’s be honest, coming home from deployment is a transition for everyone. This post has some realistic tips for life after deployment. 93. Learning to Reconnect (Military Wife and Mom) – Advice from a mom and wife who has been there. Learning to reconnect can be difficult, these tips can help. 94. Help After Deployment (LifeWay) – 4 tips to make your deployment reunion a better experience for everyone. 95. Happier at Home (Amazon) – This book came highly recommended by many military families. Reading together with your spouse could be a great opportunity to re-engage and reconnect as a family unit. 96. The Happiness Project (Amazon) – While not specifically written for military couples, many have benefitted and recommended this book for bettering their lives after deployment. 97. Things No One Told Me (MilitarySpouse) – This post about the 5 Things No One Ever Told Me About Homecoming is full of real-life advice that will help you adjust and have proper expectations. 98. 5 Lessons Learned (Jo, My Gosh!) – The reintegration tips in this post are short, sweet, and so helpful! 99. 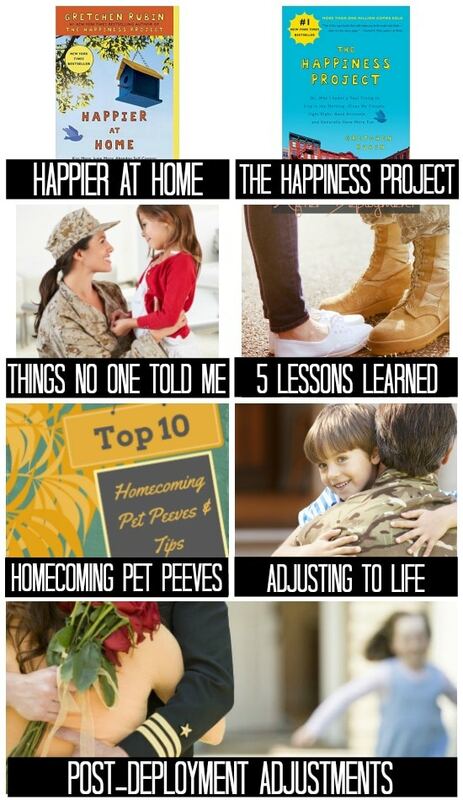 Homecoming Pet Peeves (Army Wife 101) – Learn from other army wives about their favorite tips and pet peeves of deployment homecoming ceremonies. 100. Adjusting to Life (Anchors Aweigh) – One wife’s experience and advice for adjusting to life after her husband’s deployment. 101. Post-Deployment Adjustments (The Spruce) – This very helpful post goes over what to expect upon your spouses return home. Hopefully, you feel even more excited and with the inspiration now flowing you have everything you need to plan the perfect welcome home! Are you looking forward to the day when you welcome your military sweetheart home but aren’t there yet? 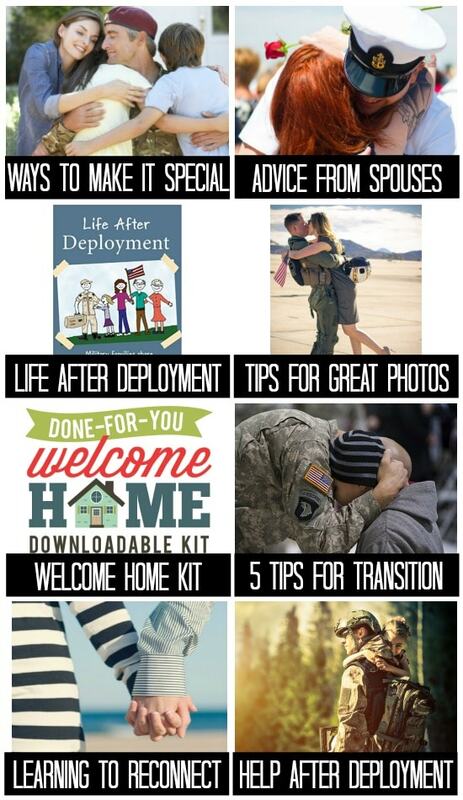 We also have great resources for Saying Goodbye, While You’re Apart, and Date Night while they’re deployed. We have ideas for all phases of your military experience, go check them out! Already a fan, and subscribe, and my husband is military. Thank you SO MUCH for doing this! I love telling people about Dating Divas! As we were preparing for my husbands deployment, the advice was to count up how long they have been gone, rather than counting down. There are several reasons for this, one being that you never know exactly how long it will be, and the other for security reasons you shouldn’t be advertising travel dates of those who are deployed. That being said, I did create for my husband and for our children a huge jar of hugs and kisses to count down until he came home (figuring I could sneak in some extras or take them out as needed.) Each day the kids got a chocolate kiss from daddy and they watched him eat his hug and kiss over Skype. It was a fun tradition and helped them feel close to him, and they didn’t even feel bad when he came home early and there were still lots of kisses in the jar. Lorraine- What a great way to count the days of his deployment. Thanks for sharing. I am sure that idea will help inspire other military couples. Thanks for all the great and cute ideas. Can’t wait to put them to use!